Here is the message I got from Quick Heal Support Team about the virus Win32.Blackmal.F that is spreading across the globe very fast. A new worm is spreading at an alarming rate. 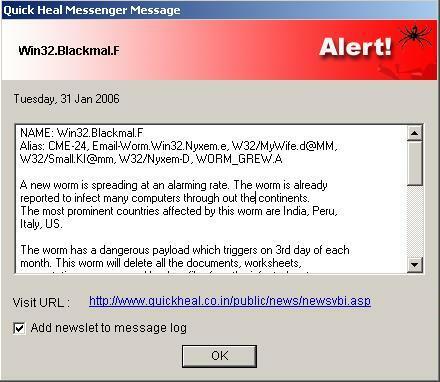 The worm is already reported to infect many computers through out the continents. The most prominent countries affected by this worm are India, Peru, Italy, US. The worm has a dangerous payload which triggers on 3rd day of each month. This worm will delete all the documents, worksheets, presentations, compressed backup files from the infected system. Solution for Win32.Blackmal.F is provided in the update released on 17th Jan and in updates released since then. 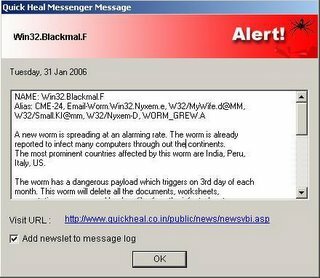 All users of Quick Heal having virus latest virus database date are protected from this worm. We request all Quick Heal users to ensure that all their copies are updated to latest virus database date and scan their system thoroughly. I have this hobby of Autograph collection. Though I am not regular at it, I've collected few autographs. Here I am displaying few autographs I've got. 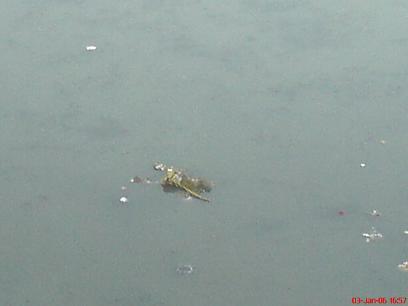 These are images from my autograph book taken by Dhiraj's Sony Erricson K750i. My net was not working for last 4 days and I was almost dead without it.. I visited one of my favourite forts, Lohagad on 25th night. Was there till 26th morning and then visited Bhaje caves fourth time. The photos will be up very soon. 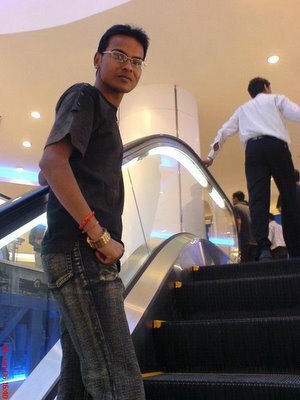 Saw Rang de Basanti on 27th. A good movie it is!! Nothing new except this. Annual fest of our college will start from 4th and I'm awaiting for that..!!! Seems like Mani Rathnam’s Yuva is getting off the reels. Five IITians, all in their 20s, have decided to take up mainstream politics. The youths, based in Jodhpur, will be in the city to campaign for their national party, "Paritrana" , which was launched in Jodhpur on Friday. "Giving up handsome pay packages, comfort of family and support of friends wasn’t that easy," says Tanmay Rajpurohit, the national president of the party and B Tech in aerospace from IIT Bombay followed by an MS from GeorgiaTech and double masters in arts. "But my inner voice told me that I should invest my efforts in my country rather than making my pockets heavier," said Ajit Ashwalayan Shukla, vice president of the party. "People think we are crazy so much so that our families have also failed to understand our motto, but we won’t give up" he added. The core team of "Paritrana" comprises Rajpurohit , Shukla, Amit Beesen, also the vice president and a B Tech (Mechanical) from IIT Bombay and a LLB graduate, Chandrashekhar (national treasurer), B Tech (computer science) from IIT Kanpur, Bharat Sundaram, the PRO of the party and B Tech from IIT Kanpur and PhD in electronics from Melbourne. "Paritrana means complete relief from the various causes of distress, and that is what we want to do for our people" added Chandrashekhar. Low funds have not discouraged them in their efforts of holding door-to-door campaigns in Gujarat, Madhya Pradesh, Rajasthan and parts of Maharashtra. "We strongly feel that the politicians of today are no longer the voice of the common man but instead they voice their own personal agendas through which they can fetch maximum votes," said Shukla. 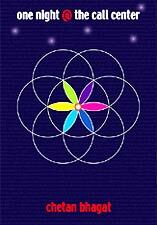 "We are not here for the power game. 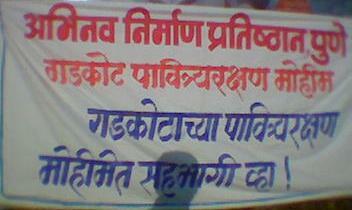 We are here to deal with the grassroots issues of each and every small village that we come across" added Shukla. The zeal and burning desire of the five youngsters sounds sincere. "I believe that we are just five ordinary boys from the middle class family with no godfathers in politics but have dared to come forward and fight for our rights" said Chandrashekhar. "And we will succeed in it" he added. Last two days, life is not going anywhere and neither am I. 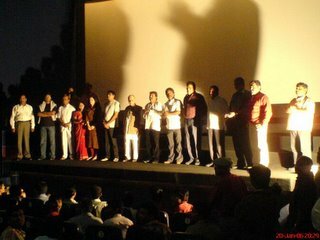 So, nothing to write..
Just sharing two old snaps..
Premier of "Ek Unad Diwas"
This Friday, I was at Mangala theatre for the premiere show of Marathi movie "Ek Unad Diwas". 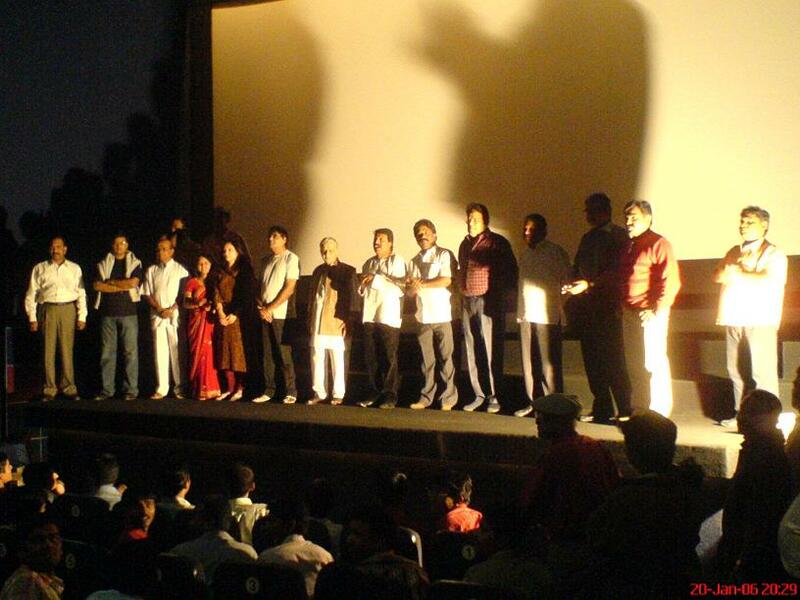 There, I got to meet Marathi Legends Ashok Saraf, Vijay Patkar, Vijay Gokhale, Viju Khote, Sammer Gaikwad etc. I also got their autographs which I'll be putting up soon. The movie, directorial debut of Vijay Patkar is really good and it touches the exact point of today's aged people who are caught badly in rules and regulations. 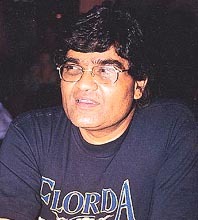 Ashok Saraf is as usual impressive in his role. Guest appearance by Vijay Patkar also won few claps. 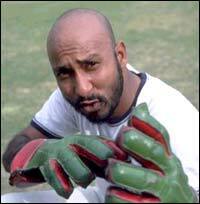 Viju Khote and Vijay Gokhale are also in guest appearances but impressive. Specially, Viju Khote as Mohanlal was a treat to watch..
My computer is not working so I'm unable to put up things in my blog for quite few days. 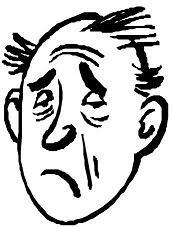 Hoping fast recovery of my comp so that I can start blogging again. Today, this company was in our college for recruitment. I appeared for their technical test and I'm shortlisted for the interviews. There were totally two technical tests. First one was about "Networking" and second was about "Linux and Mail". The interviews (technical and HR) are scheduled on Friday 20th January. An earthquake was experienced in Killari areas on Thursday 12th January at 7:40pm; within a week of previous earthquake. The fresh earthquake was recorded 3 Richter Scale. A panic has been created in the areas due to continuous strikes of earthquake. Emotions look good only in reel life. Never give them a place in real life. Else they will place you outside your life. Just completed reading this fantastic book. The whole book can be covered up in just one sentence. "You aught to read that". Its just a simple story of 6 people struggling with their own lives, until they get a call. Call from the GOD. And then there is this part of the story which actually made me think, am I living the life the way I'm supposed to? Did I ever think what I should do? The book really made me think about my life. The book taught me one basic thing. For success you need failure and self confidence. 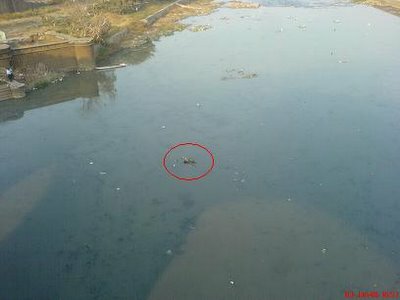 मी एक नविन ब्लॊग सुरू केला आहे जिथे मी माझ्या मनातील भावना मराठीत प्रस्त्रुत करणार आहे. माझ्या या नविन ब्लॊगलादेखील आपण भेट देत रहाल अशी अपेक्शा आहे. आपल्या सदिच्छांबद्दल आभारी आहे. हा मी आहे. (पाठीमागे तोरणा गड). Here is the feedback we received from the participants of Tikona Cleanup campaign. Kishor Bagde: organization and food was great. I liked the idea of fort cleanup. Pradnya Purke: It was a good and learnable experience. The idea of cleaning is very nice. Amol Katare: This was first time I've enjoyed so much in my life. I was amazed to see the energy shown by all. It was one of the most thrilling experience in my life. I thank Dhiraj and Dinesh for organizing the trek so well. Ameya Shete: This has been a learning experience. Hope together we can create and maintain our history. Tushar Dhage: This experience was so amazing. I met with lot of new friends. Nikhil Sawe: It was a great experience. Hope we keep up the zest. Deepmala Chavan: This was first adventure of my life and that was awesome. Thanks for being such great trek mate. Enjoyed with all. What will be your comment on this? Finally, afer planning twice and one failed attempt, I finally managed to get my body (Inspired by popular phrase: Get one's hands on :) at Malhargad. It is a small hill fort in Bhuleshwar range of the Sahyadris. It was the last fort built by the Marathas. The fort is 196 m high, and houses the temple of Lord Khandoba and Lord Mahadev. A water tank, a double layer of fortifications, and three wells are found there. The fort was built during the period of 1757 A.D. to 1760 A.D by Panse, a Peshwa Sardar, who was the chief in-charge of Tofkhana of the Peshwas; to keep watch on ‘Dive’ ghat along the Pune-Saswad route. 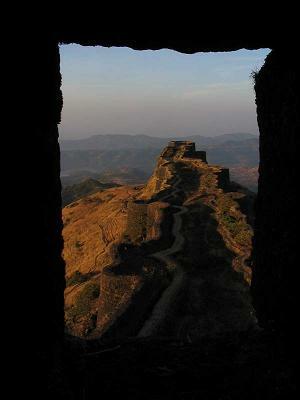 The fort has been named Malhargad because of the temple of Lord Khandoba. The night trek was filled up by missing the route once due to darkness, but finally we managed to land at the correct place. The photos will also be up very soon. I read many times at many places that everything should be pre-planned. But in my case, planning never worked out. 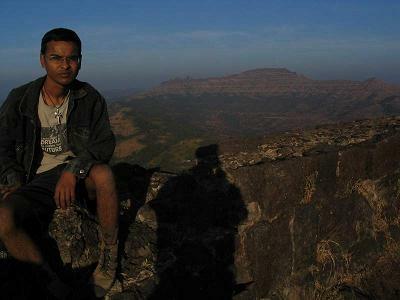 It started from Tung trek in January 2005, when I had to change plan suddenly and we reached Lohgad. (View photos). 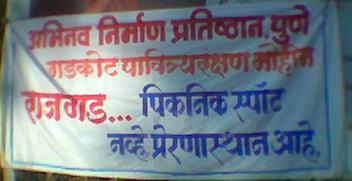 Then came July 2005 when we planned for Vairatgad and reached Rajgad. However, climbing Rajgad was unsuccessful. 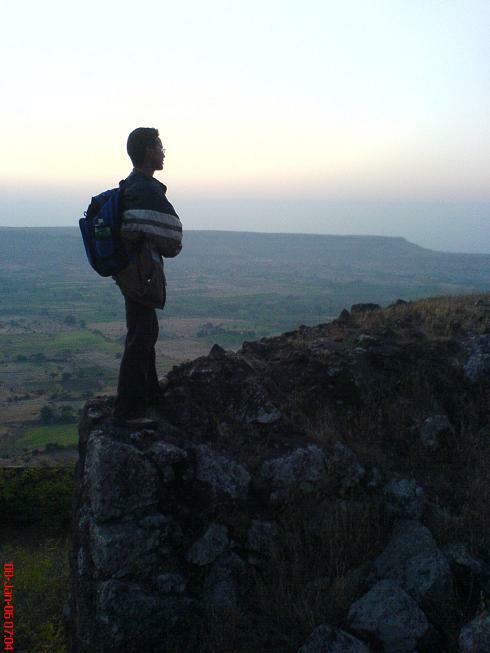 Then, on new year eve, I had plans of Malhargad-Purandar-Wajragad but finally I landed at Rajgad. Yesterday, again I planned for Malhargad and had to get satisfied on a long drive upto Dive. Moral of the story is "Never plan things. Directly execute." Today, while I was passing by corporation bridge, I saw a large crowd looking towards river from the bridge. I stopped to have a look and I noticed a human body floating in water. The head was cut and only portion below neck was visible. It clearly seemed to be a murder case. Here are the snaps I shot. 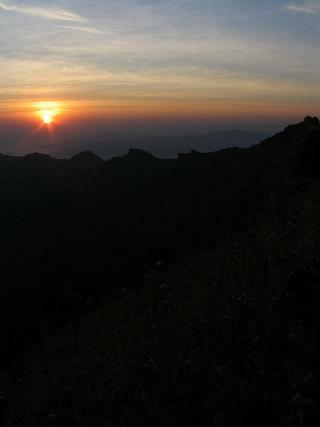 Leaving for a trek to Malhargad (Also called as Sonori). Will publish detail report after coming back tomorrow morning. Bye guys. After planning too many things for new year eve, finally I was at Rajgad for new year eve. I had tried this fort previously but this was first time I completed the fort. Will publish detail report tomorrow. By the way, Abhinav Nirman Pratisthan, Pune had a really great job of checking belongings of trekkers and banning drinking, smoking and non-veg material on the fort. Here are a couple of snaps of the publicity hoardings by the organisation. I really appreciate their job, and I think we all should come forward to help these guys in their attempt.